The TeleSpy is a clever and reliable combination of a telephone, a motion sensor, and a microphone. The TeleSpy is an ordinary telephone that doubles as a monitoring system. Simply enter any phone number you want the unit to call and turn the motion sensor switch to on. Should motion be detected the phone will dial the number entered and upon answering you will be able to listen in via the amplified microphone on the unit. 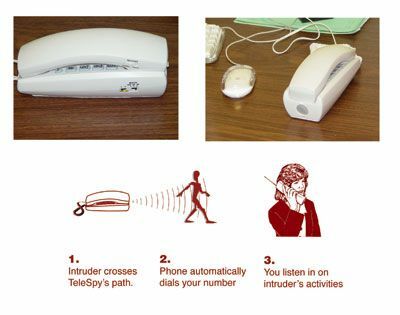 The TeleSpy allows you to decide from a safe location if it is a friend or foe before calling the police. The listening period is about 30 seconds, then the TeleSpy disconnects and instantly re-arms to detect again and again.